This antibody is specific for human cIAP2. It does not cross-react with any other IAP family members. Synthetic peptide within Human cIAP2 aa 400-500. The exact sequence is proprietary. Our Abpromise guarantee covers the use of ab32059 in the following tested applications. WB 1/1000. Predicted molecular weight: 72 kDa. 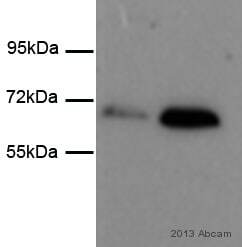 Anti-cIAP2 antibody [E40] (ab32059) at 1/1000 dilution + Daudi cell lysate. ab32059 at a 1:50 dilution staining cIAP2 in human normal spleen, using Immunohistochemistry, Paraffin Embedded Tissue. cIAP2 was immunoprecipitated using 0.5mg Daudi whole cell extract, 5µg of Rabbit polyclonal to cIAP2 and 50µl of protein G magnetic beads (+). No antibody was added to the control (-). The antibody was incubated under agitation with Protein G beads for 10min, Daudi whole cell extract lysate diluted in RIPA buffer was added to each sample and incubated for a further 10min under agitation. Proteins were eluted by addition of 40µl SDS loading buffer and incubated for 10min at 70oC; 10µl of each sample was separated on a SDS PAGE gel, transferred to a nitrocellulose membrane, blocked with 5% BSA and probed with ab32059. My doubt is related with the antigen retrieval step used to obtain these specific results. Do you recommend an antigen retrieval step with these antibodies?. Please notice, these protocols may be optimised, and could not work with your specific tissue. Ab32059: Steam slides in 0.01M Sodium Citrate Buffer, pH 6.0 at 125°C for 30 seconds followed by 10 seconds at 90° C into a decloaking chamber / pressure cooker. Removes slides and rinse in TBST before proceeding to the staining step. Ab113237: Steam slides in 0.01 M sodium citrate buffer, pH 6.0 at 99-100°C - 20 minutes. Remove from heat and let stand at room temperature in buffer - 20 minutes. Rinse in 1X TBS with Tween (TBST) – 1 minute at RT. Thank you Yes Ill be working tomorrow. Please ship. Id like to run one wb before going on the holidays. Merry Christmas and Best wishes for a Happy New Year! Ok great, this will ship out tonight. Please keep me updated, and I look forward to hearing from you! Thanks for getting back to me. I'm sending a vial of ab23423 free of charge on the order ***, which we have in stock and can be delivered tomorrow. Will your receiving department be open tomorrow, or should I set it for a later delivery? Please keep me updated about your coworkers' results using the older antibodies and your results with this new one. I am hopeful that one of these will work! Happy holidays and best wishes. Thanks for your reply and for your patience while i have been in touch with the lab. I have heard back from the lab, and I don't see anything unusual in their protocol so I don't have a great explanation for these results. At this point, I would suggest trying a different BIRC3 antibody (though I know you've already tried 2). I've looked through the antibodies that we have to this target, and I think that ab23423 looks promising. 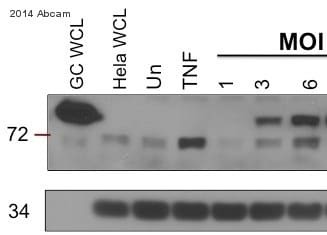 The WB image on the datasheet shows some extra bands (thought to be cleavage fragments or non-specific bands), but we only have 1 complaint on this antibody since it has been sold. Ab23423 has also been used in 3 references. As I mentioned before, these antibodies are covered by our guarantee, so I can issued a credit or refund if you would prefer. I apologize for all of the difficulty with these antibodies, and I'm hopeful that we can identify one that will work for you. I look forward to hearing from you. Please let me know how you would like to proceed. Thank you for your reply and for sending the additional information. I am in touch with the testing laboratory to ask for further suggestions to get the correct results. I do have a few more questions, just to make sure I understand the images that were sent. Could you possibly label the molecular weights of the ladder? And also to clarify, the left membrane with the high background is the monoclonal or the polyclonal? I apologize for the inconvenience but I have conflicting information in my notes and I want to make sure the details are accurate. I will get back to you once I hear from the lab, and please let me know if you have any questions. I look forward to hearing from you and resolving this promptly. Thanks for sending the image again. I'm sorry to see that the results are so poor with this replacement antibody. Do any of the bands on the blot correspond to the expected band size of cIAP2? How much lysate do you load into each well? The testing laboratory uses 5% non-fat dry milk instead of BSA to block the nitrocellulose membrane, and some antibodies are sensitive to blocking agent so it might be worth a try. Do you also dilute the primary and secondary antibodies in solution containing milk or BSA? This can be removed if so. Have you tried blotting for a loading control protein like beta actin on the same membrane, to check that the HRP and ECL kit are working well? We do guarantee this replacement antibody to work as well, so if the results do not improve I would be happy to issue a credit or refund for your original purchase. Please let me know if you have any questions or if there is anything else that we can do for you. Thank you for keeping me updated about this situation and for sending the protocol information and image. I unfortunately can not open the Gel file. Could you re-send it in pdf or jpg? I will be happy to see if there are any suggestions that might improve the results. The replacement antibody is also covered by our Abpromise so we would be happy to issue a credit or refund if we can not improve the results. Please let me know if you have any questions or if there is anything else you need. No specific bands in WB with these antibodies. Thanks for your call today and for letting us know about the trouble with these antibodies. As we discussed, I am sending a free of charge replacement vial of ab113237 on the order ***, which I expect to arrive December 1. Please keep me updated about the results with ab32059 using HeLa lysate. I look forward to hearing from you. Let me know if you have any questions or if there is anything else that we can do for you. Have a great week and a happy Thanksgiving!